When the unthinkable happens … what happens next? A nuclear weapon destroys Lower Manhattan. A million people die. Millions more flee from a gigantic, deadly cloud of fallout. The crisis has only begun. President William Orwell Steele and his cabinet labor to cope with the aftermath of an unprecedented terrorist attack, while a host of ordinary Americans struggle merely to survive in a world where everything has changed. From the corridors of power to the squalor of refugee camps, from world capitols to the lawless frontiers of Pakistan, from economic collapse to armed rebellion, the impact of the May Day attack swiftly spreads to every aspect of society and every corner of the globe. 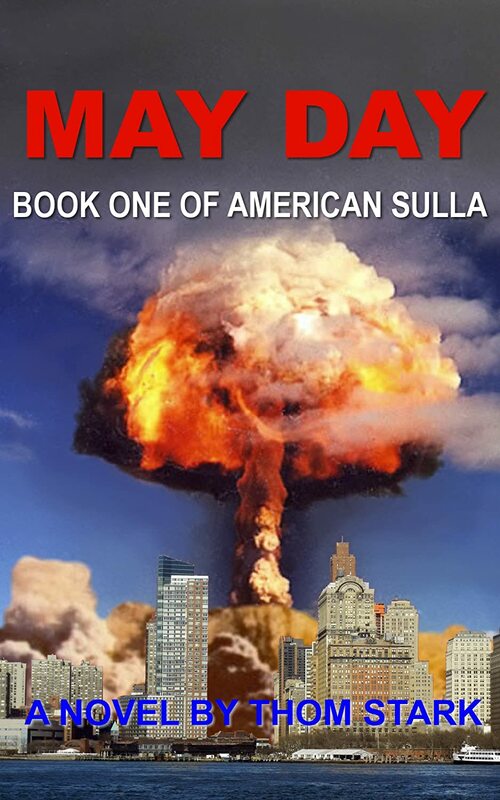 Thoughtful, intelligent, and wildly entertaining, May Day – Book One of American Sulla solidly establishes author Thom Stark as the master of disaster. The most ambitious thriller in decades, the first book in the American Sulla trilogy will leave you cheering the debut of a major new talent. My Review: This is a book that makes me wish I still belonged to a book club, because I desperately want to talk about it for hours. It's the type of book that makes me wish the others in the three-book set are complete, because I really want to immerse myself in the story once again. It's the type of book that also makes me wish I could give it more than five stars because my enjoyment of this book goes way beyond, well... enjoyment. I finished reading the book a day ago, but I can't get it off my mind. I feel deeply affected by not only the story, but by the questions raised within the pages of this well-written book. Stark raises questions most of us never consider. After the September 11 terrorist attacks, I think most people have some idea of the havoc created by such an event. I think most people can even puzzle out what might happen after a nuclear attack. But, how many people stop to consider the ripple effect such an event might cause? What happens to those who survive the blast, only to discover their homes will remain uninhabitable for generations to come? Where do all those people go? And, how does a government that is barely holding up under crushing debt manage to find the resources to support millions of refuges? What happens when the economy begins to crumble, or when insurance companies file bankruptcy? This book is well-researched and raises issues most readers have never considered. It's thorough, factual, and remarkably unbiased. Stark writes in a very straightforward manner and keeps his own political opinions from interfering with the story. What really sets this book apart, though, is the author's ability to go way beyond the obvious environmental, economic, and political repercussions of a nuclear terrorist attack. He also looks at our country's deep-seated prejudices. He shows us the ugly side of humanity and people who seek to profit from disaster, and shows us those who use tragedy as an excuse to let lawlessness run rampant. He introduces us to a conspiracy theorist who has the ability to tap into the fears of like-minded individuals who are willing to act on their hatred. He also delves into the psyche of a man who is forced to harness almost unlimited power while under immense pressure and personal grief. May Day is a multifaceted read that kept me glued to my e-reader. It's a thought-provoking, well-written book I would recommend to everyone over 18. It isn't often that I can recommend a book to all readers, regardless of the type of book they like to read. But, in this case, I can make an exception. The book is highly readable--the type of book that should be made into a movie. Read it and really think about the question, "What if?" About the Author: Thom Stark has been a professional writer since 1995. He is best known as a columnist and feature writer for the late, great Boardwatch Magazine. Mr. Stark currently lives in Chillicothe, Ohio, with his wife Judy and their lovable mutts Wally and Watson. He is hard at work on War – Book Two of American Sulla.